Missing Pet Partnership, under the leadership of Kat Albrecht, has conducted hundreds of Intersection Alerts. This technique is not guaranteed to be successful, but in many cases it has been the key factor in recovering a lost dog. What is an “Intersection Alert”? An Intersection Alert is basically an advertising campaign, except instead of trying to get people to vote for your candidate, come to your fundraising car wash, or shop at your mattress store you are advertising a lost dog. Not only are you making people aware that a dog is missing, but you are also conveying how much your dog means to the owner, and how motivated they are to get their dog home. Generally speaking, people want to be helpful, but they are more likely to offer help when they see all of the effort that is being put into the recovery effort. Coordinate and schedule a group of volunteers, family, and friends to help you for several hours. Make 4 to 10 large, neon signs and hundreds of 8.5″ x 11″ flyers (handouts). Choose an intersection location and time based on local traffic and based on the circumstances of the dog’s disappearance. Conduct your intersection alert in a safe manner, reaching the maximum number of people while managing risk. Although you could do this with just one person if that’s all you could muster on short notice, it is best to have at least four people. Eight people per intersection would be ideal. If you have lots of people who want to help, then you can spread them out in groups of four to eight at strategic intersections. With more people, it may be handy to stay in touch with two way radios, but at least make sure everyone has each other’s cell phone numbers. Depending on how many people you find and what time they are available, schedule your intersection alert at a busy time, at an intersection near the point your dog was last seen. Specifics of choosing an intersection are below. You can use children to do this work, if a parent or guardian is with them, but your team should consist of adults, mostly, since you will be active at a busy intersection. Tell people to dress in layers and bring gloves because your hands can get really cold holding that sign for three hours. 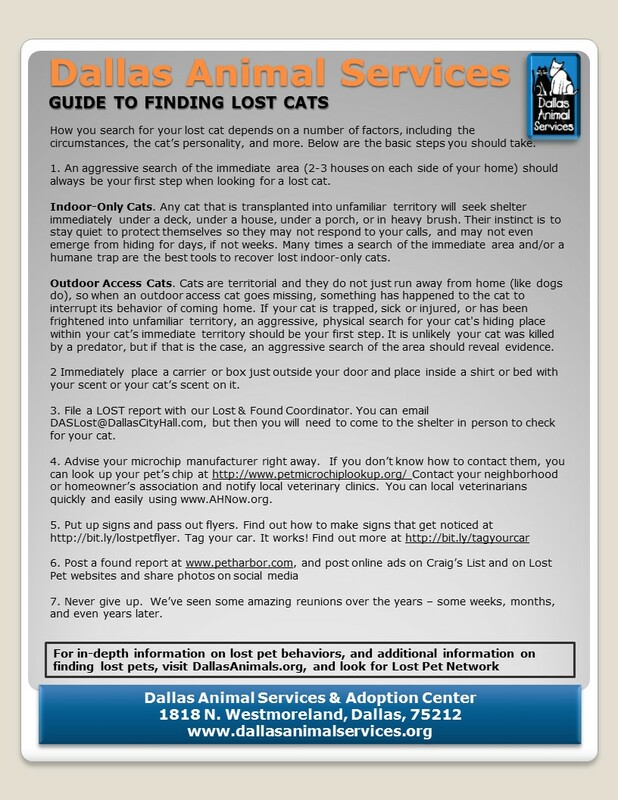 We’re often asked if Intersection Alerts could be used for lost cats. The answer is yes – Intersection Alerts can be used for any species. However, in most cases cats are less visible because they’re trapped, injured, or hiding in fear and the most effective recovery method for lost cats is to conduct a physical search as suggested on our Lost Cat Recovery page. The reason that Intersection Alerts work well for dogs is that dogs travel farther, they are noticed by people, and they are picked up and “rescued” by people who often tell friends and family about the “abandoned” dog they found. You can purchase the large, neon poster boards at many grocery stores, Walmarts, or craft supply stores. To make the large black letters, we invest in a stencil and an ink roller because we make so many of them, but you can accomplish the same lettering with a thick black marker. Make the lettering large, thick, and legible. You may wish to rough out the letters in pencil before going over it in marker. The object is to have those three simple words, REWARD, LOST DOG, visible from a great distance. As people drive closer, they will be able to read the smaller text. For the text and the picture, you will want to buy two plastic sheet protectors for each sign. Tape them onto the signs in the middle, side by side, with clear, thick tape. Also, tape them on with the openings down, in case it rains. After the paper is in, you hold it in with a small piece of tape on the bottom. For the picture, choose the largest, simplest, color picture you can find of your dog. You want people to see the picture of your dog from a distance. You may have better pictures, perhaps of your dog in a field or by a stream, or wearing a funny hat, but for the purpose of this sign, you want a picture that is simple and clear. Spend a little extra money on getting a good quality print on good paper. For the text, you want to choose a large font (Arial font, size 85 to 90 or larger) and just a few words. 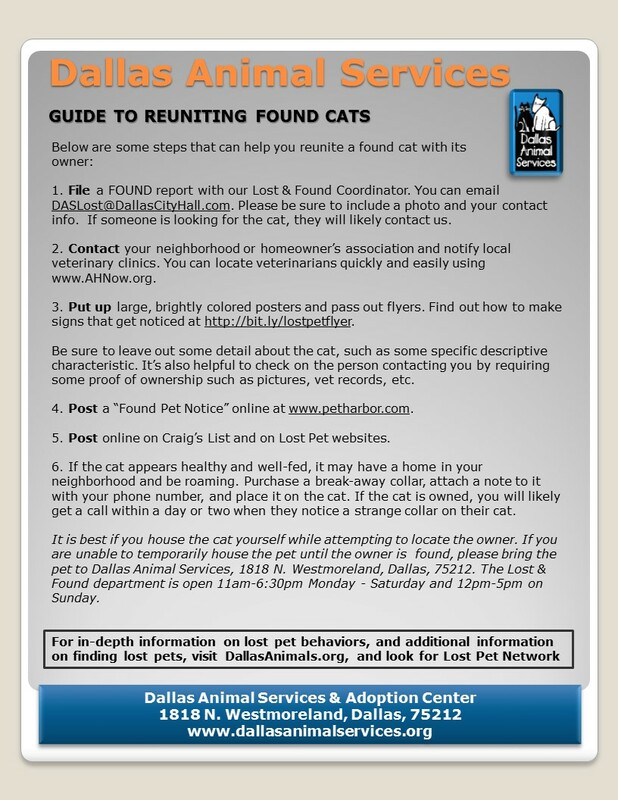 Use Missing Pet Partnership’s 5 + 5 + 55 Rule for making posters. State the breed and the most distinguishing characteristics in the fewest words possible. It seems like half the missing dogs in the world are black labs with no distinguishing markings, which makes things difficult, so if your dog is wearing a distinctive collar, then mention that in your description. If you have a breed that would be unfamiliar to the general public, like a Plott Hound or a Catahoula, you are better off just saying Large Hound, because most people won’t know what a Catahoula is. Finally, your phone number should be in a large font as well, so people can enter it right into their cell phones and call you with a tip instantly. Your sign is ready to go with the large letters, plastic sheet protectors, clear picture, and readable flyer. If you have time, you may wish to improve the sign with cardboard taped to the back for rigidity, and a stick to hold onto. Wire “H” frames used for real estate signs are handy because you can stick your sign in the ground if you need to go off to talk to someone or take a short break. In addition to your large signs, you will want to print up several hundred flyers to hand out to people who stop for information. 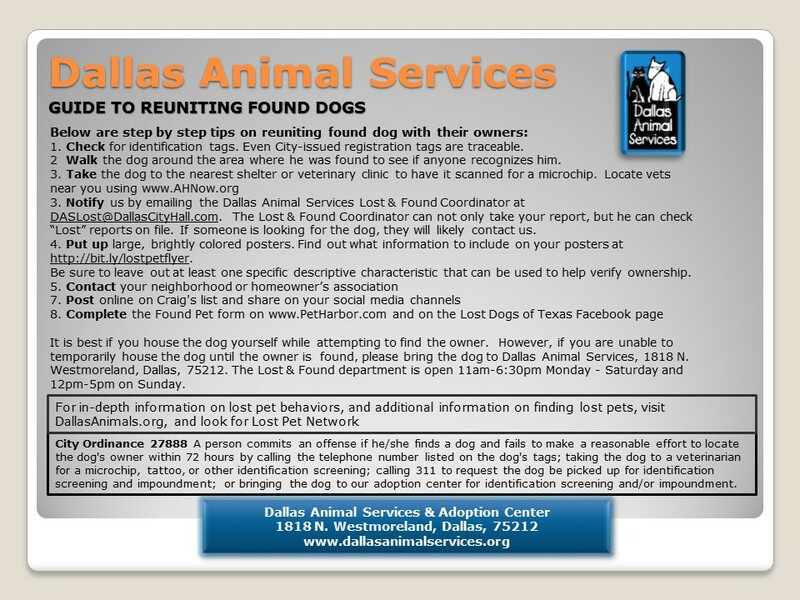 Your flyer can have more detail than the sign because people will be able to take it home and read it at their leisure. Include your cell phone number, rather than your home number, if possible. If someone reports a sighting of your dog, you will want to keep that person on the line and have them keep watching your dog from a safe distance while you drive to meet them. You should always offer a reward, but in most cases it is best not to specify an amount (although not everyone agrees on this). If you mention a large reward amount, it will get more attention, but it will also attract opportunists who will waste your time with false leads, hoping to take advantage of you in your time of desperation. Be prepared to weed out the opportunists and cranks by asking them to describe a detail of your dog that they couldn’t have known just from seeing your sign or flyer. Unless your dog is unfailingly gregarious, you will probably want to include instructions for people NOT to try to capture your dog or chase after him. In many cases, failed attempts at capture have just made the dog harder to recover. Your flyer should also include a clear picture of your dog. Test a couple of pictures to see which turns out best in black and white. The best intersection at which to conduct this exercise will depend on where and when your dog went missing. If you know the exact time your dog was last seen, it is best to conduct your intersection alert at about the same time, so you will catch the attention of people who move through the area at a regular time of day, perhaps commuting to work, on a delivery route, or walking their dogs at their usual times. Choose an intersection near the point last seen, or near your home if your dog escaped from home at an unknown time. Pick an intersection where all directions must stop for a light or a sign. If the main street goes through without stopping, you will find it too difficult to get people’s attention or hand them a flyer. Some intersections with traffic lights can be too large because you are far away from the other side and hard to see. Ideally, you want a 4-way stop sign near the point last seen that has constant traffic at a certain time of day. A 4-way stop that gets only one car every five minutes won’t be as useful, even if it is near the point last seen. If your neighborhood was designed with basically one way in and out, then that will make sure you catch the attention of any person who might have seen your dog. If you have plenty of volunteers, you can choose two or more intersections, and you can cover the various possible directions your dog might have travelled. Keep Safety as Your #1 Priority! Once you have made your signs and flyers, enlisted your volunteers, and selected a location or locations, you are ready to begin your intersection alert. If you have the ideal number of eight people per intersection, set up four teams of two, one holding the sign and one handing out flyers. Safety is your highest priority. Many people are so desperate to find their missing dogs that they stop taking common sense precautions to protect their own safety. You can’t find your dog if you are in the hospital recovering from being hit by a car. You aren’t doing your dog any good if you don’t keep yourself safe. Also, while you do want to catch people’s attention, you don’t want to cause an accident! With safety in mind, each two person team should set up facing a lane of travel, near the stop sign or stop light. If you have a child on the team, he or she should hold the sign, up on the sidewalk away from traffic, and an adult can hand out the flyers. Hold the sign so people can read it, and you may wish to slowly rotate the sign as people roll up to the stop light so they can see it most easily. If someone rolls down her window, hand her a flyer if you can do so without disrupting traffic or putting yourself at risk. One person can hold the sign and hand out flyers if necessary, but ideally you want two people per corner. If no traffic is approaching from your direction, turn so people on the other side can see your sign until more traffic comes along for your lane. Most people won’t have specific tips on your dog, but they will take the flyers home and call you if they see something. At most Intersection Alerts, you will get a few leads. Ideally, someone has your dog, and they can lead you right to him. More often, you will get a tip that your dog was seen at a certain place and time. If you do get such a tip, you can send one person to investigate, or it may be appropriate to move the whole Intersection Alert Team to a new location and start fishing for tips there. If you get no leads at all after three hours of waving signs, that doesn’t mean no one has seen your dog. You can try this again at another time in the same location, or try your luck at a different location based on the probabilities of your dog traveling in different directions for different reasons. 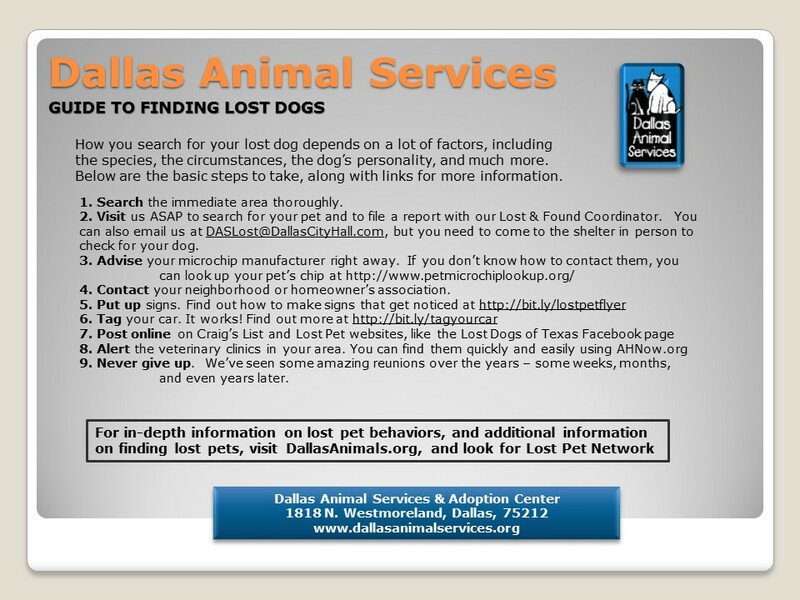 Quite often, dogs go missing when they are new to a family or new to a location. If you can’t predict your dog’s direction of travel based on past history in the neighborhood, you can still generalize based on your dog’s breed, personality, and physical traits. At a minimum, you can be certain your dog will want water, so you should be aware of all possible water sources in the area.